From 20 October 2017 to 11 February 2018 Photographer’s Gallery in London presents an exhibition of works on Polaroid camera by Wim Wenders . The exhibition features over 200 Polaroid works by Wenders, as well as a selection of clips from Wenders movies in which the Polaroid featured. The central feature of Instant Stories: Wim Wenders’ Polaroids is a previously unseen display of Polaroid photographs taken by the artist and director. It is a reminder of Wenders’ influence on photographers and filmmakers, an insight into his processes and inspirations, and a celebration of Polaroid as a photographic format. Many of the Polaroid photographs in the exhibition were taken by the filmmaker as he travelled to make his films Taken from the 1970s onwards, they give glimpses into different film sets and locations worldwide. 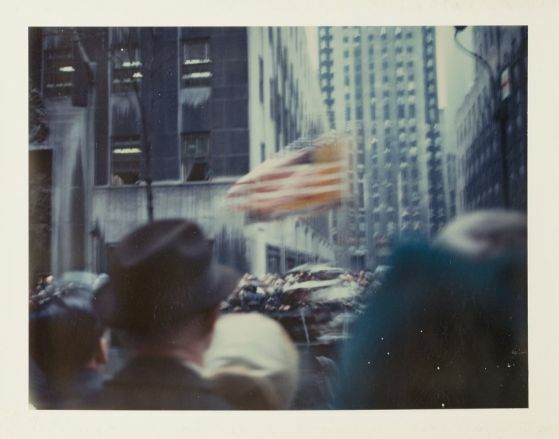 Wenders began using Polaroid in the late 1960s while developing his skill as a filmmaker, and the format came to have a diaristic function for the director, as well as being a kind of notebook or sketchbook where ideas were tested before being fully realised on set. As well as being a diary, Wenders’ Polaroids were also, due to their production process, a catalyst for his thought process. Polaroids could be taken in intimate moments and spaces, and the Polaroid camera offered opportunities for proximity and interaction which led Wenders to question and challenge the subject-object relationship.